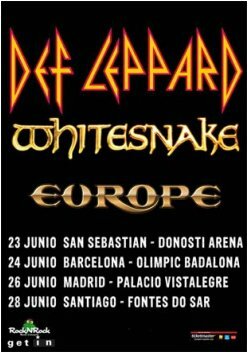 Def Leppard will not play the full Hysteria album at their Madrid show on 26th June according to guitarist Vivian Campbell. Vivian told fans on facebook that the band will not be featuring the full album at the Madrid show and it will have a 'regular' setlist. He had previously mentioned the Hellfest organisers specifically asking for the Hysteria show in France which takes place on 21st June. This suggests the album will also not be played at the other three Spanish shows. The local press releases/venues for the shows in Sweden and Norway stated the shows there would "focus on the Hysteria album". Will you perform VIVA HYSTERIA in Madrid? "The past 21 years with Lep have all been great, Rick. They're an exceptional bunch of guys and they don't lack in the music dept. either. No Hysteria show in Madrid - regular mix n' match show."